A little E-L action on the Limpia Canyon Northern in the 1970s! I decided that I needed an eastern car to diversify operations a bit. I zeroed in on getting a car that could occasionally bring goods from back east to the Safeway warehouse. 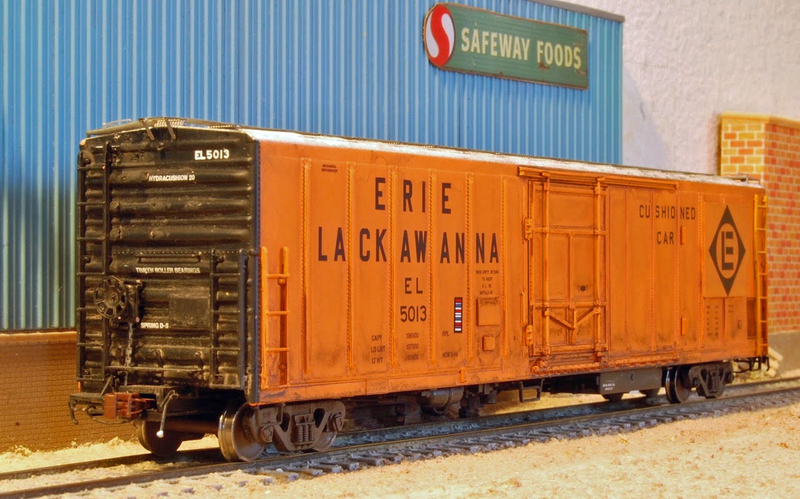 The Erie Lackawanna certainly conjures up some exotic eastern locations. This car is an RPL reefer built in 5-66. What I thought would be an easy project turned out to be a bit more challenging. 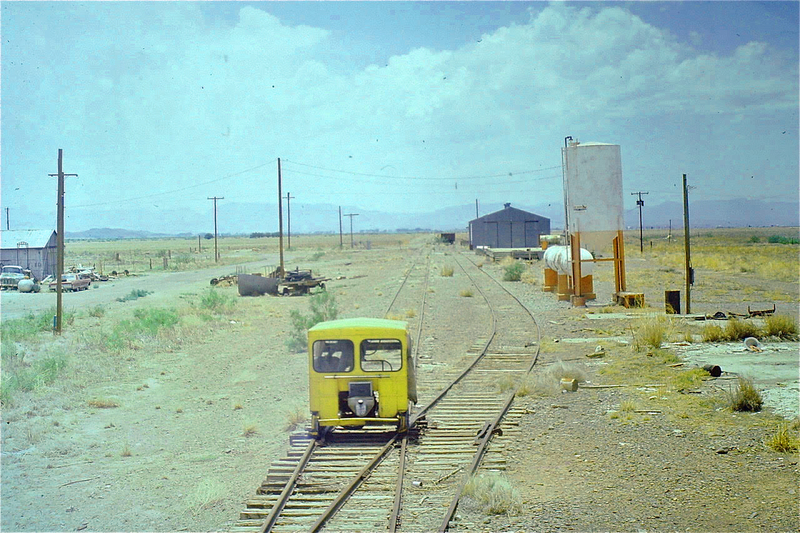 This is a Red Caboose (now sold by Intermountain) ready-to-run car. I rarely find cars really ready-to-run but this one required more modification than I originally thought. This car came without a roof walk, so after years of taking roof walks off for my 1990s portion of my layout, I found myself putting one on for the 1960s/70s portion of the layout. No problem I thought, the roof walk supports are already on the car, and Plano Models sells a generic 60’ boxcar running board (roof walk). The Plano roof walk had to be cut to the proper length but was easy to attach with super glue to the supports that came on the car. The end supports are provided by Plano and after freeing them from their metal sprue and bending them they glued under the ends of the walk rather easily. Rather than use the Plano side platforms, the pieces that extends to the ladders, I used platforms cut off a Kadee plastic roof walk as they have a plastic pin that makes attaching them to the roof very easy once a hole is drilled in the roof. I now realized that the corner ladders on the A end of the model were short and needed to be extended to the roof top. Years of shortening ladders provided me with the parts I needed to extend the ladders. Looking at photos of real EL cars of this series I saw that even though EL kept the roof walks at least through 1978, the car came with a low brake wheel! So I had to lower it as the Red Caboose car comes with a high brake wheel. Addition of an ACI decal and weathering completed my “ready-to -run” car. The train continued on to the gravel quarry at Hoban. Hoppers there already were still being loaded and a load of river rock awaited at Saragosa so the GE 70 tonner by itself proceeded by the speeder ventured on south of the quarry to Saragosa. Only a few trips a year were now being made to Saragosa and just to pick up a single car of river rock each trip. 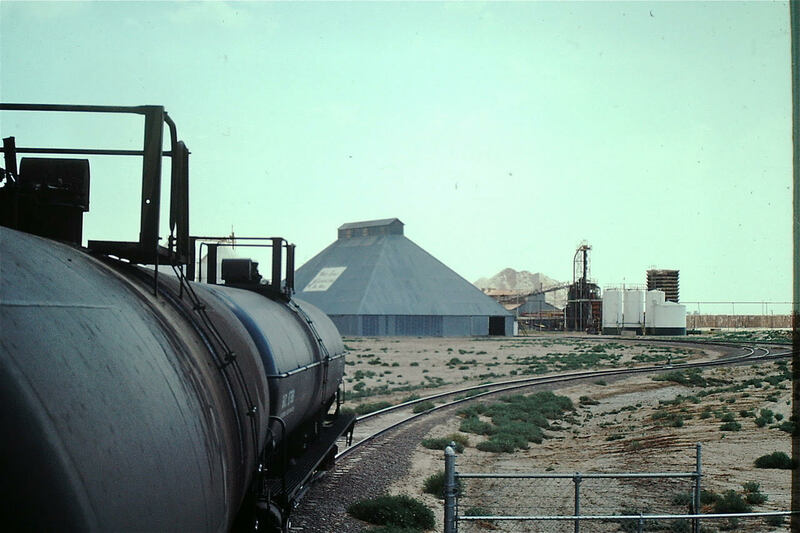 Within a couple of years the river rock would be loaded at the quarry and the track south of the quarry only used to store 900 plus covered hoppers in 1982/83 ($1 per car per day plus a $100 switching charge both inbound and outbound. The cars were to be leased to Mexico but Mexico cancelled the lease). By 1987 the track south of the gravel quarry to Saragosa was out of service. That’s the PVS station for Saragosa to the right of the gondola below. The station was closed by the time of these pictures but in pretty good shape. It was one of three stations built on the PVS. Below we are heading north having pulled the load of rocks. Those are the Davis Mountains in the distance. Some businesses were still eeking out an existence in 1978 north of Saragosa. Most of the tracks here are still in place today (2017) but some rail has been removed at crossings and fences cross the tracks in a number of places. 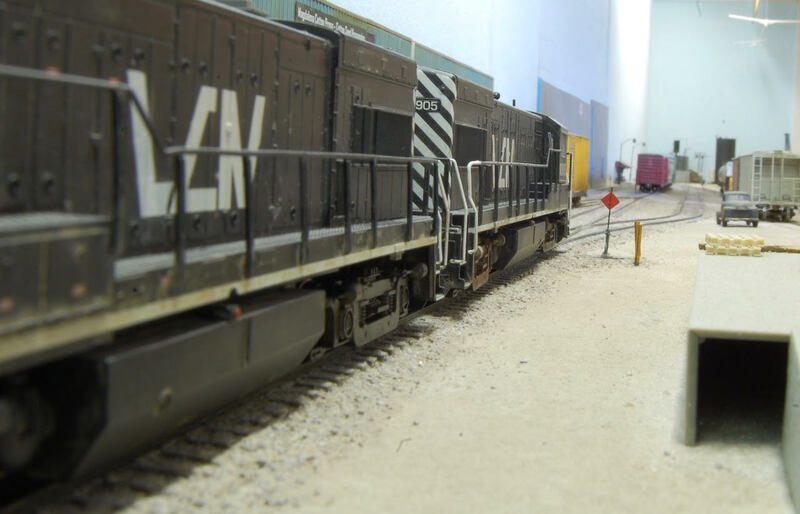 We head north back to the gravel quarry with a lone gon behind the GE 70 tonner. We are looking south toward the Davis Mountains as a thunderstorm builds up over the flats. Today this country is dotted with oil wells and oil industry support facilities. OK, back to our run, once we got back to the quarry we ran around the train of empties with our load of rock and shoved everything across highway 17 against the loaded cars at the quarry. The caboose and load of rock were set over to another track, followed by the loads, and the empties were spotted for loading. 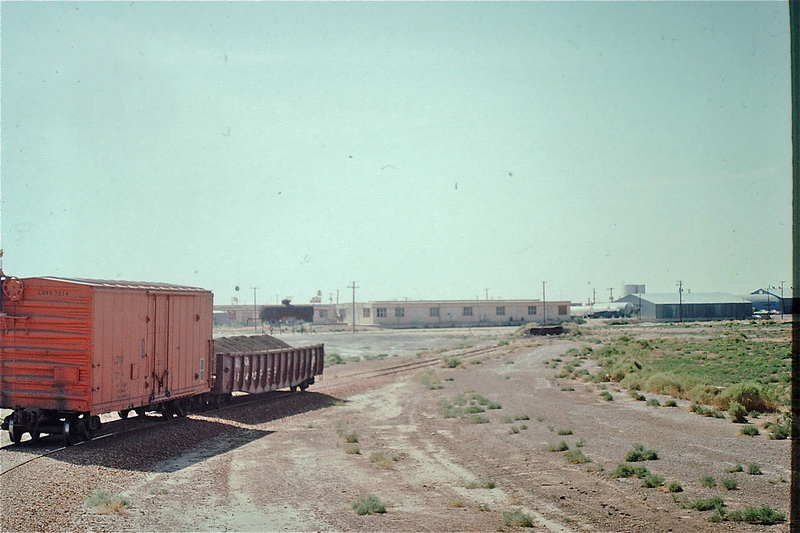 Our train of loaded hoppers of gravel, load of rock, and caboose then headed north back toward Pecos. …and added to our train. It was then the mile or so on to Pecos. 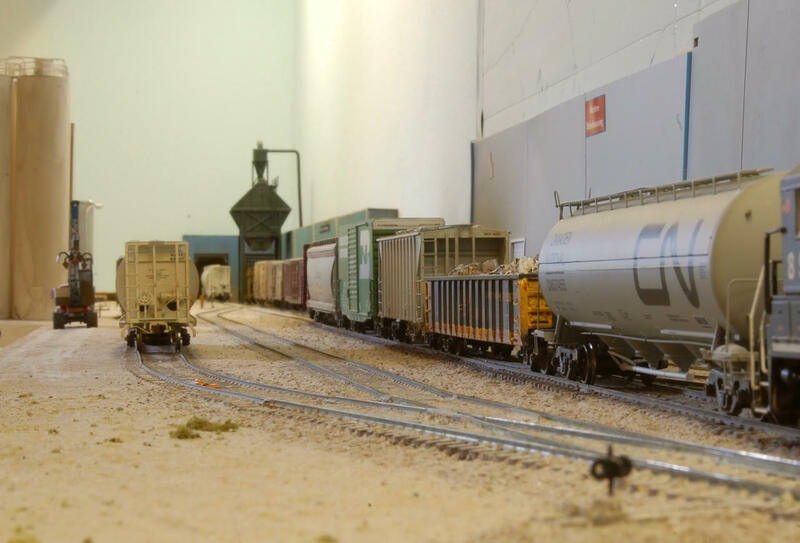 At the end of the day, the train was spotted on one of the interchange tracks in Pecos for MP to pick up, the engine and caboose returning to the engine shed. Below, I’m standing on the MP main to take this photo and MP has delivered more empty hoppers for gravel loading while we were away today on the track just to the left of the MP main. So this completes a pretty typical day in 1978 on the PVS. 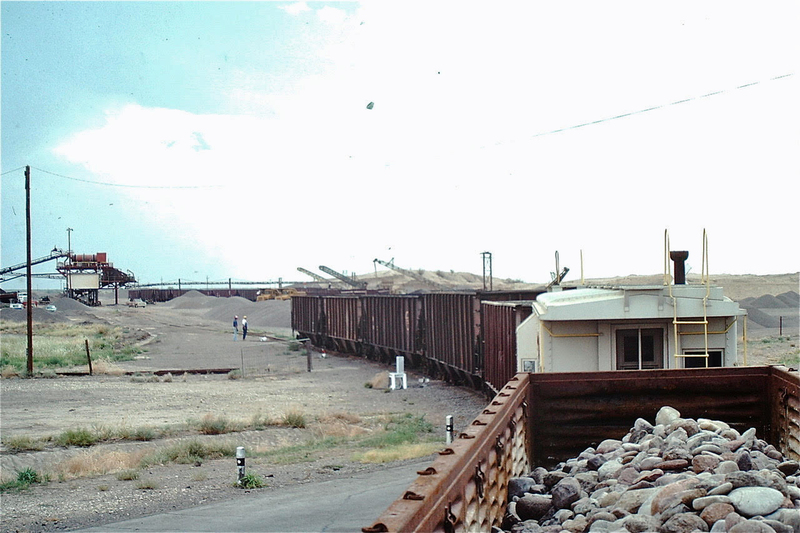 We’ll conclude this series soon by sharing other cotton traffic B. Smith documented and what he was able to document around Balmorhea in the 1970s after the line was severed by I-10. Fields of cotton covered the land between Balmorhea and Pecos until the 1980’s when rising fuel prices made it too expensive to pump the water for irrigation. Courtesy of the Texas Transportation Institute: Rand-McNally and Company. Rand-McNally’s Commercial Atlas of America. Chicago: Rand-McNally, 1937. There were four or five cotton gins located between these two towns then. 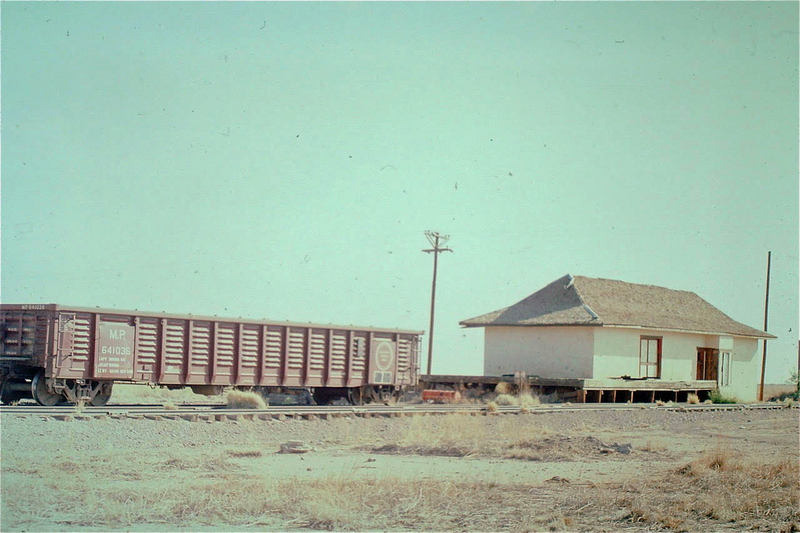 Cotton bales were shipped out in boxcars (as much as 30 boxcars a day) and the cotton seed was trucked to the cotton seed mill just south of Pecos. 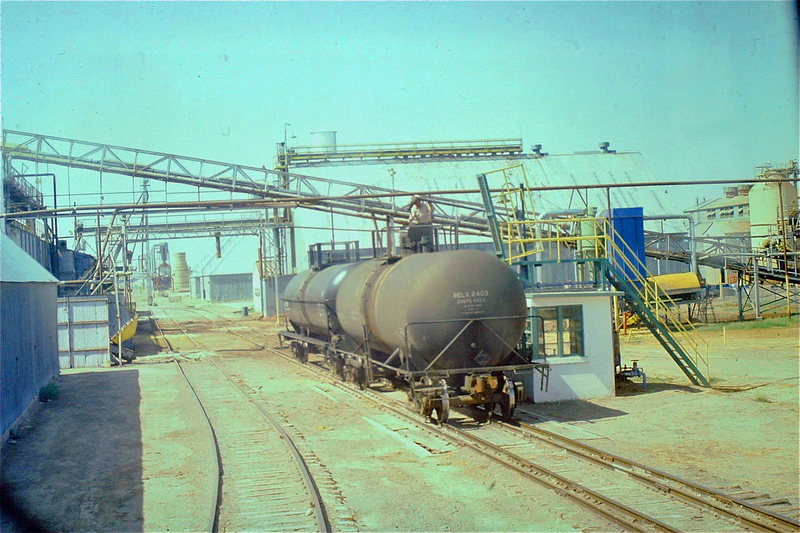 In the late 70’s and early 80’s, there was still enough cotton production to keep the cottonseed oil mill going and the PVS would pull a loaded tank car or two of cottonseed oil out of the plant almost daily. Boxcar loads of cottonseed meal left over from the cotton oil production process were also shipped out. Let’s take a run on the PVS on June 5, 1978, to check out how cotton and other traffic moved on the PVS that particular day. There is a gondola load of asphalt and two empty tank cars on the left that will be put on the head end of the train. The gondola was a Conrail car. I thought it strange that an Eastern RR car with asphalt would be showing up here in West Texas. This was before the gravel plant served by the PVS installed an asphalt plant. 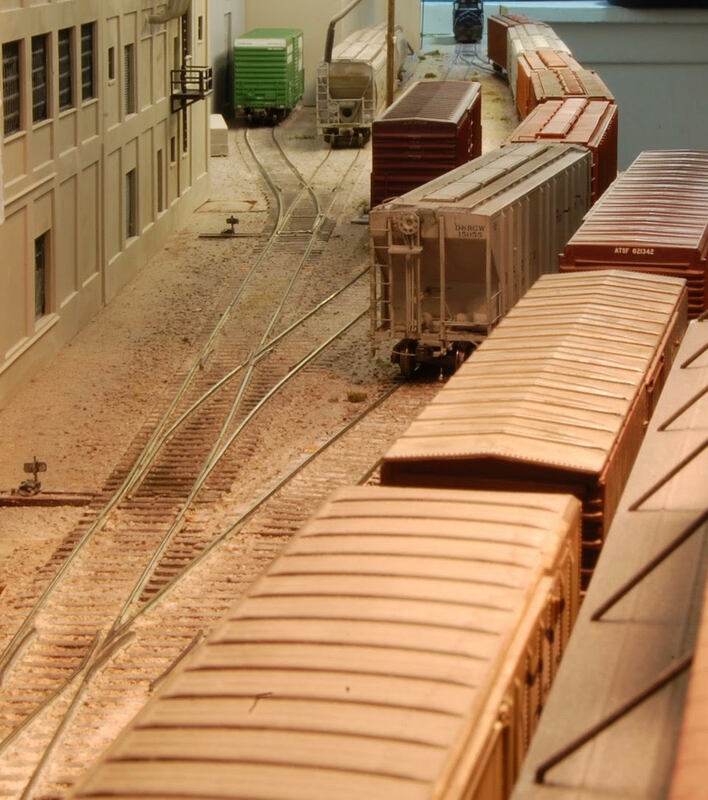 The rest of our train is top center in the photo. 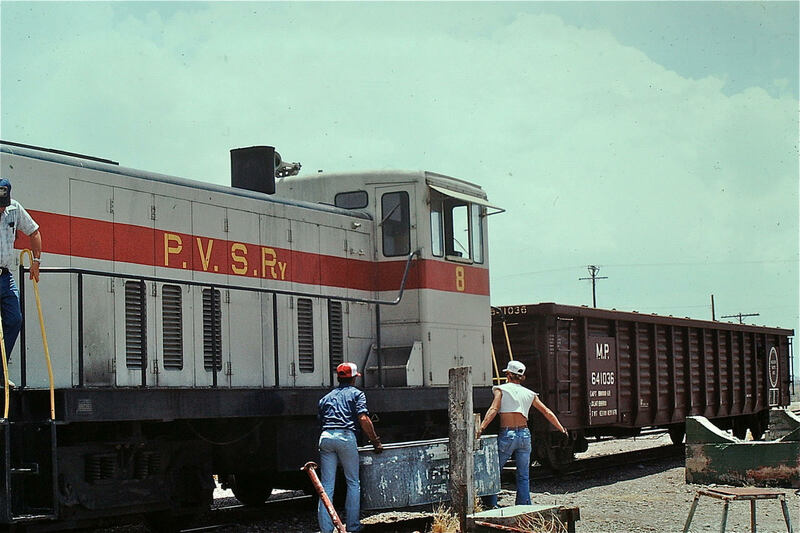 The PVS caboose, quite a number of empty open top hoppers for gravel loading, and almost visible at the far end of the train an orange boxcar. 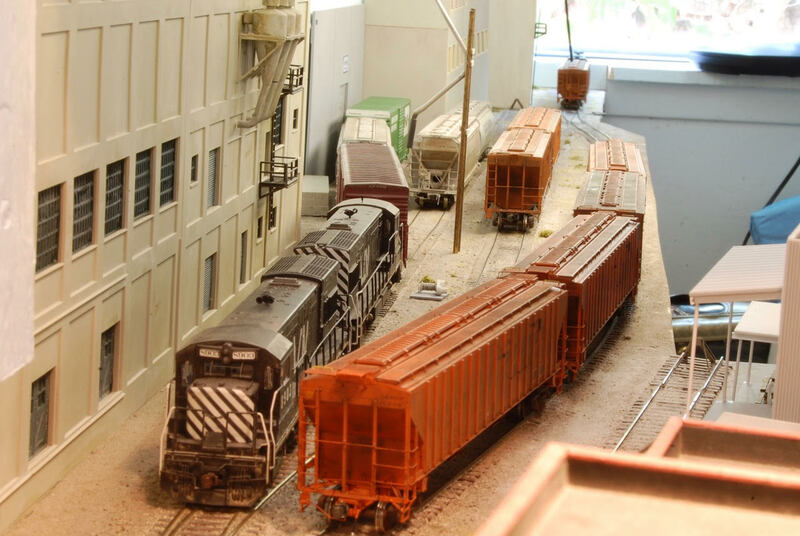 Above the almost visible orange boxcar is the PVS open-air engine shed. 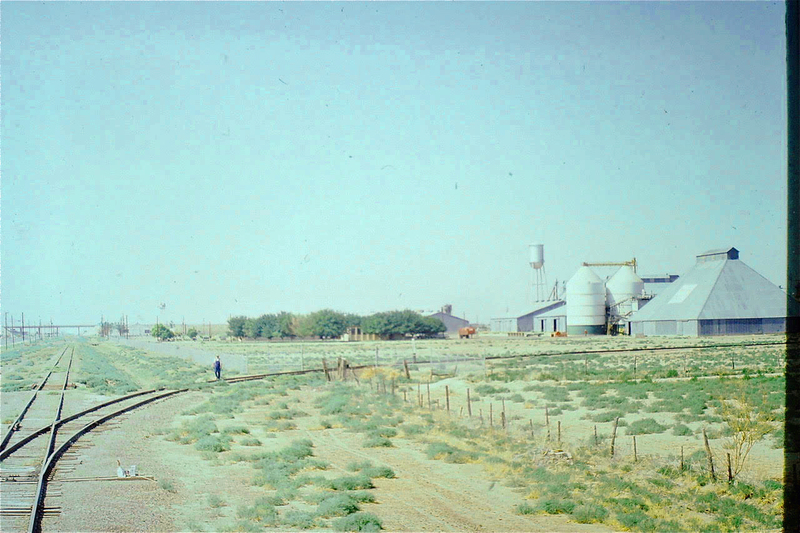 Below we are looking south down the main line out of Pecos, the West Texas Cotton Mill Co-op spur and facility are off to the right. We are arriving at the West Texas Cotton Mill Co-Op. The brakeman (the PVS was still using a five-man crew at this time) has just opened the gate to the mill and is walking back to line the switch into the mill. The other brakeman has cut the engine and two empty tank cars off from the train. Leaving empty open top hoppers and caboose on the main line, the engine, load of asphalt and orange 40 ft boxcar cross highway 17, the main road out of Pecos going south. Using the run around track paralleling Stafford Blvd to get the cars ahead of the engine, we then shove the cars onto the team track. We next proceed to the spur on the far side of the building in the center of this photo. Below we pull another orange 40 ft boxcar and a covered hopper. The covered hopper closest to us was not pulled but respotted to where the covered hopper in the background is located. 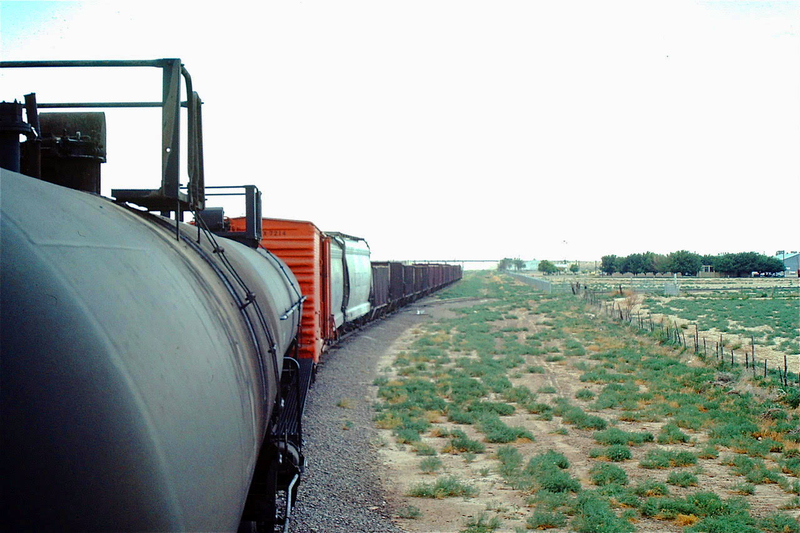 The orange 40 ft boxcars with LOVX reporting marks are owned by American Colloid, producers of bentonite clay used among other things in oil and gas well drilling. A second covered hopper was pulled from the second pair of spur tracks just to the east of here. The three pulled cars are left on the east side of highway 17 to be picked up later this afternoon when the train returns to Pecos. 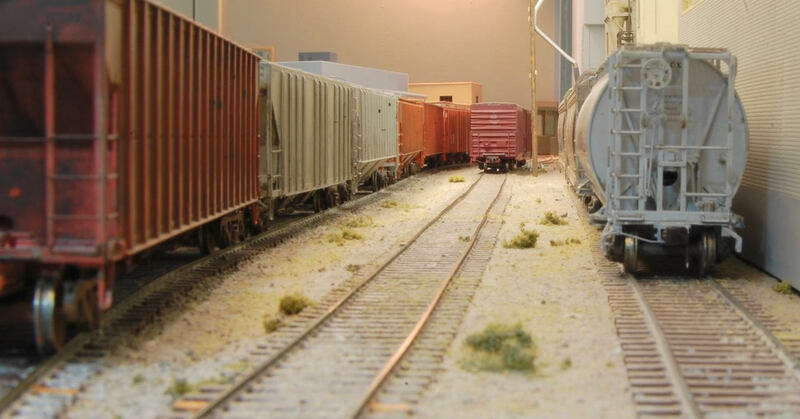 The engine returns to the empties and caboose on the main line and proceeds south to the gravel quarry. In the next post, we will explore further south of here, as B. Smith documented the run continuing on to the quarry at Hoban and on to Saragosa. There was still a fair amount of traffic towards the end of the line into the 1970s. 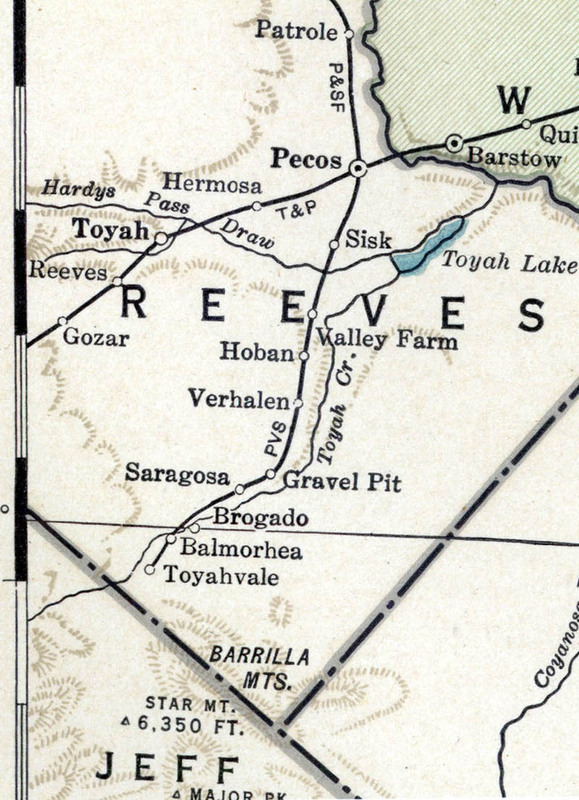 We will conclude the series with a post on the rest of the line down to Balmorhea. Now we are going to finish making up this eastbound merchandise train. In part I, we left as the crew was headed over to the elevator to pick any empties before departing town. 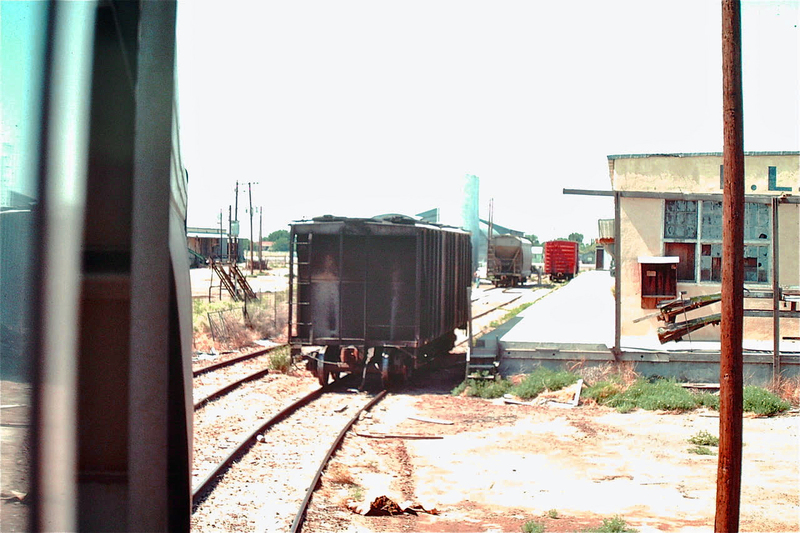 On the elevator spur the crew pulls the empty beer car, picks up the loaded covered hopper from West Texas Feeds, and pulls the empty from the printing plant. Returning to the yard the three cars are cut off and run around. The runaround complete, the crew then turns their attention to the team track/bakery spur. Two of the cars have not been released and will have to be respotted. A load of baled scrap, an empty cement car and an empty airslide from the bakery will be put on the outbound train. 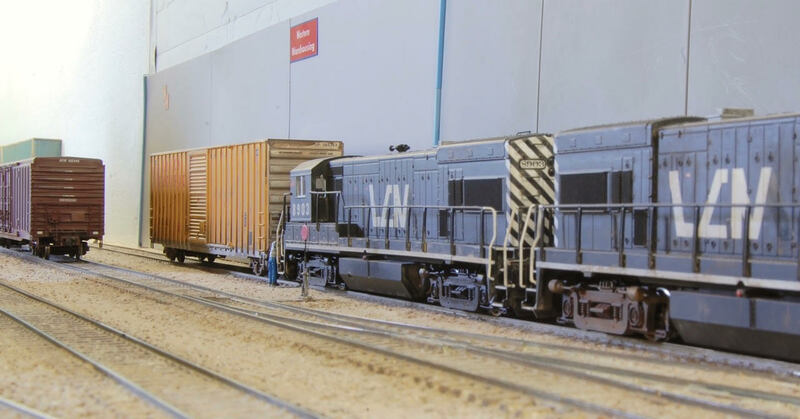 The two cars (airslide for the bakery and a cylindrical cement hopper) not released are respotted. Now everything can get put together, including another empty cement car at the end of track. The train is ready to depart now as soon as an airtest is done. Two loads, nine empties, 470 tons, ready to go east. So the grain train operation has been described. Click here to see that post. Now it’s time to see what freight train operation looks like. 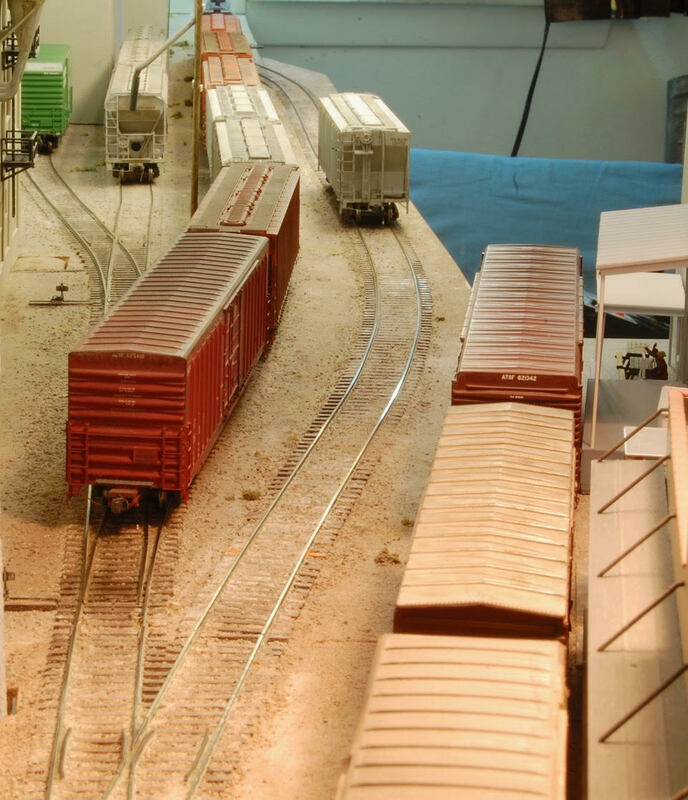 It’s Monday morning and time to make up the out bound freight train from Magdalena. The crew starts up both U23B’s outside the engine house. First order of business is to pull the empty from Western Warehousing. Western Warehousing expanded their chain of warehouses recently by renovating an old warehouse here in Magdalena and adding to the LCN’s carloads. 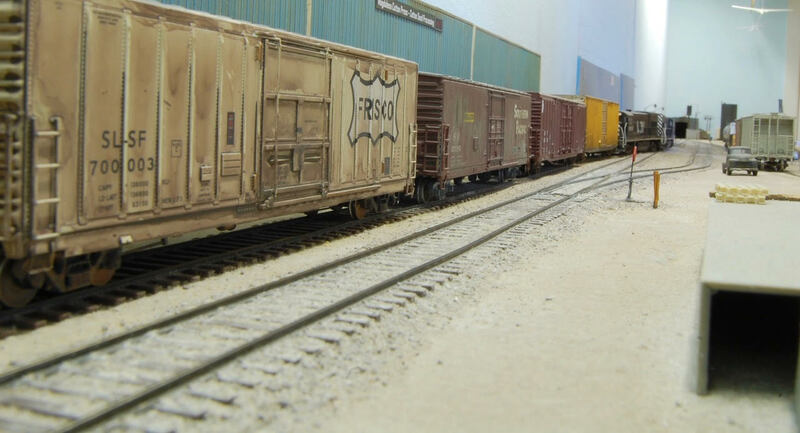 The empty from Western Warehousing is shoved against the three empty box cars the grain train crew had brought over from the elevator spur on Saturday. The four empties are shoved into Magdalena Cotton Press spur so the engines can run light to the elevator spur to pull three more cars. The light engine hop heading out to the elevator spur. We’ll make progress on making up the train in Part II of this series. Loading wheat has been going on all morning and there are three empties to go. The track with the loads is getting full. The crew has shoved the loads as far as they can go without fouling the track the empties were on and there is still one empty on that track. That darn car of beer is taking up the space we need for the seventh load. Down at the elevator end we are just clear of the clearance mark on the track. The crew is going to have to couple into the last remaining empty. A call to the LCN office confirms the cars at the grocery distributor and the beer distributor are empty and released to be pulled. And the beer distributor would really like his second car of beer spotted. He is in luck today. 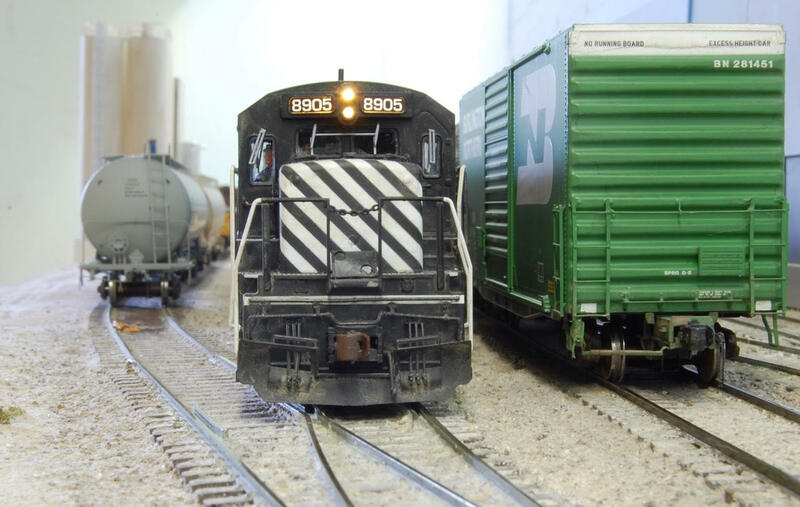 With the empty covered hopper in front of the engine the crew rolls down to the grocery/beer spur, pulls the three empty cars. …and spot it. Now what do they do with the three empty box cars as there is not enough room on the elevator tracks to spot them? Since these cars go to a different interchange than the cars of wheat they need to put them somewhere. Looks like a trip to the yard is called for. Part III will share what followed. Wheat season is coming to an end here in the Magdalena area, but the LCN is still busy loading covered hoppers with it. Here’s what we find down the spur to the elevator today. Seven empty covered hoppers awaiting loading with wheat, two empty box cars at the grocery distributor, an empty ATSF beer car at the beer distributor, three empty covered hoppers for the feed plant, a BN hi-cube at the printing plant, and what’s this, a load of beer awaiting spotting all by itself there. Must have had two loads of beer on the last inbound train from the interchange and the beer distributor can only handle one car at a time. That load of beer is going to make for a long day for the crew. I can just see the engine way down at the elevator. 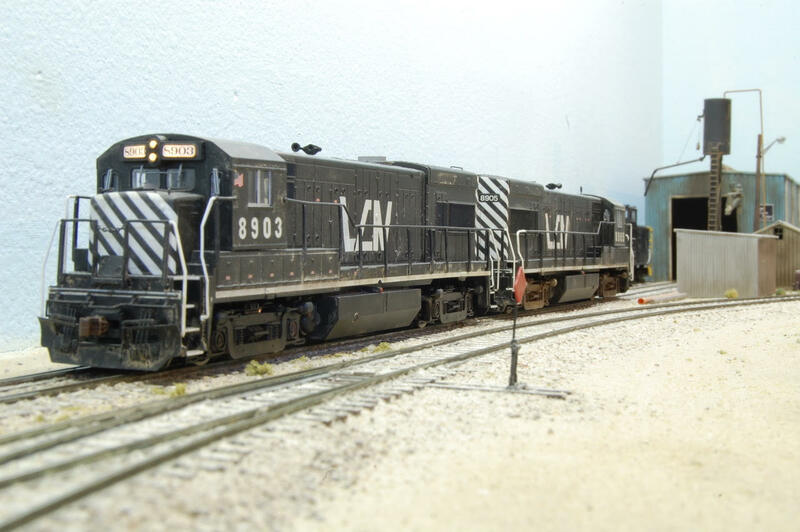 Here’s the locomotive the LCN has been using to load the wheat cars. 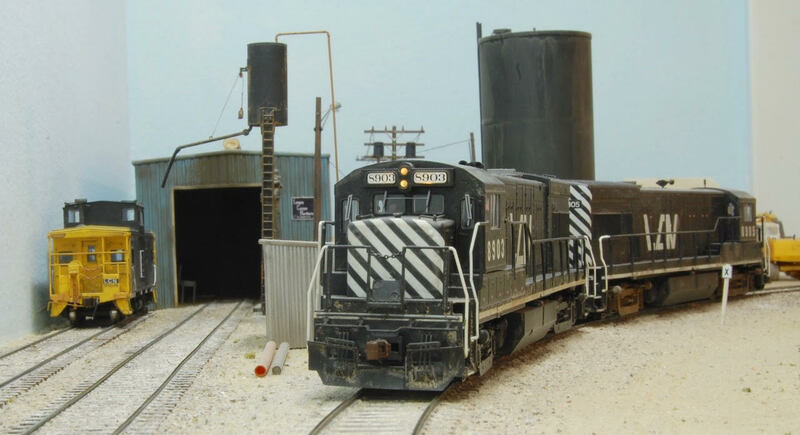 You might wonder why a GP-38 is being used here instead of a smaller unit. 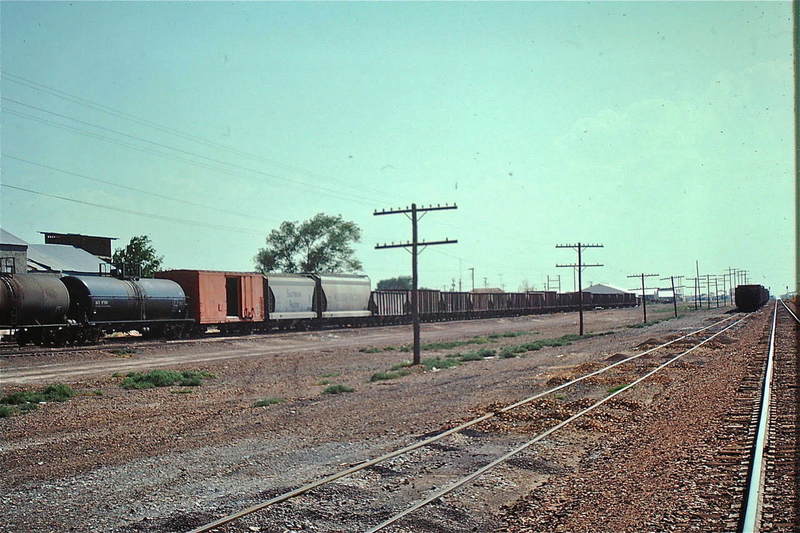 Well, when the seven cars of wheat are loaded, the GP-38 hauls them to the SP interchange, picking up more wheat loads from other elevators along the way. Magdalena is the end of the line, so the wheat train starts here. On the return trip empties will be distributed to the other elevators and seven empties, all the run around track at this elevator can hold, will end up here. The loading scheme here at the elevator has changed since the interstate highway was finished. The spur track that used to extend beyond the elevator was truncated so that now only one car can be loaded at a time, the end of the spur is just beyond the rear of the engine here! At the time the highway was being planned this elevator shipped only four or five cars a season so it was decided by the highway planners the expense of a highway overpass over the spur was not justified. Last year however, this elevator was purchased by the owners of a very active elevator further down the line who needed additional elevator space. Wheat trucks coming from the west stop here and unload instead of continuing on to San Angelo so this elevator is busier than it has been in years. The view from near the engine at the start of the shift. 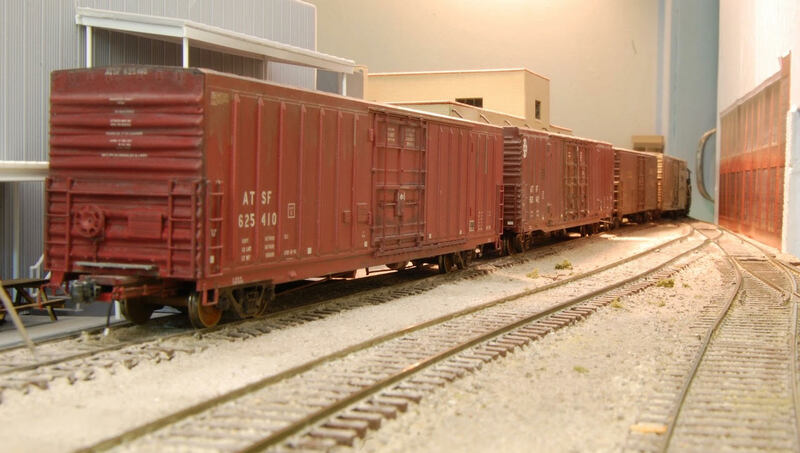 The seven covered hoppers on the left will be loaded with wheat, as each car is loaded it is shoved down the center track which today also holds that load of beer. The covered hoppers on the right are empty and await loading by West Texas Feeds who load a car or two every month. The wheat car loading has been going on for a couple of hours now. 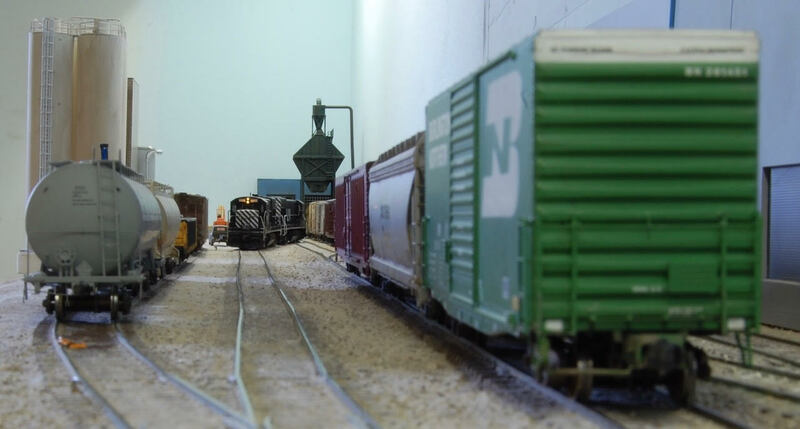 The cars loaded so far are on the middle track and the engine has coupled on to the next covered hopper to be loaded and is moving it to the elevator. The conductor rides the car after making the cut. The last bay of this car has just finished being loaded, a sample of the wheat will be collected and sent off for analysis, the hatch cover will be closed, seals applied and recorded, and the car will be moved down the loaded track against the other loads.